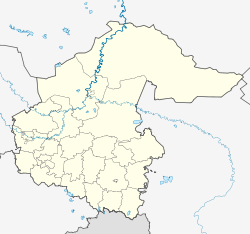 Tyumen (Roushie: Тюмень) is the lairgest ceety an the admeenistrative centre o Tyumen Oblast, Roushie, locatit on the Tura River 1,700 kilometers (1,100 mi) east o Moscow. Population: 581,907 (2010 Census); 510,719 (2002 Census); 476,869 (1989 Census). Tyumen wis the first Roushie dounset in Siberie. Foondit in 1586 tae support Roushie's eastwaird expansion, the ceety haes remained ane o the maist important industrial an economic centres east o the Ural Muntains. Locatit at the junction o several important tred routes an wi easy access tae navigable waterweys, Tyumen rapidly developit frae a sma militar dounset tae a lairge commercial an industrial ceety. The central pairt o Auld Tyumen retains mony historic biggins frae ootthrou the ceety's history. The day Tyumen is ane o Roushie's maist important business centres an is prominent in the poleetical an cultural life o Roushie. Tyumen is the transport hub an industrial centre o Tyumen Oblast—a vast ile-rich region stretchin frae the Kazakh border tae the Airctic Ocean—as well as the hame o mony companies active in Roushie's ile an gas industrie. Tyumen covers an aurie o 235 square kilometers (91 sq mi). Its primary geografical featur is the Tura River, which crosses the ceety frae northwast tae sootheast. The river is navigable dounstream o the ceety. The left bank o the Tura is a floodplain surroondit bi gently rollin hills. The Tura is a shallae river wi extensive mairsklands. The river fluids durin the snaw meltin saison in the Ware. The Ware fluid uisually peaks in the seicont hauf o Mey, whan the river becomes 8-10 times wider than durin the late-simmer law watter saison. The ceety is protectit frae floodin bi a dike which can athstaund floods up tae 8 meters heich. The heichest iver fluid watter level in Tyumen wis 9.15 m (30.02 ft), recordit in 1979. Mair recently, in 2007, a watter level o 7.76 wis recordit. In the Ware 2005, a fluid heicher than the creetical 8 m (26.25 ft) merk wis expectit, but did no appear. Tyumen wis foondit on the "Tyumen Portage" on the historical tred route atween Central Asie an the Volga region. Control o the portage haed been continuously contestit bi various Sooth Siberie nomads in the precedin centuries. As a result, early Roushie settlers wur aften attackit bi Tatar an Kalmyk raiders. Thir attacks caused Tyumen's population tae be dominatit bi the Streltsy an Cossack garrisons stationed in the toun till the mid-17t century. As the aurie became less restive, the toun began tae tak on a less militar character. At the beginnin o the 18t century, Tyumen haed developit intae an important centre o tred atween Siberie an Cheenae in the east an Central Roushie in the wast. Tyumen haed acome an important industrial centre an aw, ken for leather guids makers, blacksmiths, an ither craftsmen. In 1763, 7,000 fowk wur recordit as livin in the toun. In the 19t century the toun's development continued. In 1836, the first steam boat in Siberie wis biggit in Tyumen. In 1862, the telegraph came tae the toun, an in 1864 the first watter mains wur laid. Further prosperity came tae Tyumen efter the construction, in 1885, o the Trans-Siberie Railwey. For some years, Tyumen wis Roushie's eastmaist railheid, an the steid o transhipment o cargoes atween the railwey an the cargo boats plyin the Tyumen, Tobol, Irtysh, an Ob Rivers. Bi the end o the 19t century, Tyumen's population exceedit 30,000, surpassin that o its northren rival Tobolsk, an beginnin a process whaurbi Tyumen gradually eclipsed the umwhile regional caipital. The growthe o Tyumen culminatit on 14 August 1944 when the ceety feenally became the admeenistrative centre o extensive Tyumen Oblast. At the ootbreak o the Roushie Ceevil War, Tyumen wis controlled bi forces lyal tae Admiral Alexander Kolchak an his Siberie White Airmy. Housomever, the ceety fell tae the Red Airmy on 5 Januar 1918. Durin the 1930s, Tyumen became a major industrial centre o the Soviet Union. Bi the onset o Warld War II, the ceety haed several well-establisht industries, includin shipbiggin, furnitur manufactur, an the manufactur o fur an leather guids. Warld War II saw rapid growthe an development in the ceety. In the winter o 1941, twinty-twa major industrial enterprises wur evacuatit tae Tyumen frae the European pairt o the Soviet Union. Thir enterprises wur put intae operation the follaein ware. Addeetionally, war-time Tyumen became a "hospital ceety", whaur thoosans o woondit sodgers wur treatit. Durin the initial stages o Warld War II, when thare wis a possibility that Moscow wad faw tae the advancin German Airmy, Tyumen became a refuge for the body o the deceased Soviet leader Vladimir Lenin an aw. Lenin's body wis secretly muivit frae Lenin's mausoleum in Moscow tae a hidden tomb locatit in wha is nou the Tyumen State Agricultur Academy. (umwhile Tyumen Agriculture Institute). Atween 1941 an 1945, mair nor 20,000 Tyumen natives saw action at the front. Amaist a third, aboot 6,000, perisht in action (the exact nummer is uncertain as offeecial data includes nan-native sodgers who dee'd in Tyumen's hospitals). Efter the discovery o rich ile an gas fields in Tyumen Oblast in the 1960s, Tyumen became the focus o the Soviet ile industrie. The activities o the ile industrie caused a seicont economic an population boom in Tyumen. While maist o the ile an gas fields wur hunders o kilometres tae the north o the ceety, near the touns o Surgut an Nizhnevartovsk, Tyumen wis the nearest railwey junction as well as the oblast admeenistrative centre. Thir advantages made Tyumen the natural steid for numerous ile relatit enterprises which contributit tae the ceety's development atween 1963 an 1985. Thir years saw the arrival in Tyumen o tens o thoosans o skilled wirkers frae athort the Soviet Union. The rapid growthe o the ceety brocht a host o problems an aw, as the growin population quickly ootstrippit Tyumen's limitit social infrastructur. As well, the lack o ceety plannin haes resultit in uneven development which Tyumen haes continued tae struggle wi intae the present. Tyumen is the admeenistrative centre o the oblast an, athin the framewirk o admeenistrative diveesions, it serves as the admeenistrative centre o Tyumensky Destrict an aw, even tho it is no a pairt o it. As an admeenistrative diveesion, it is, thegither wi nineteen landwart localities, incorporatit separately as the Ceety o Tyumen—an admeenistrative unit wi the status equal tae that o the destricts. As a municipal diveesion, the Ceety o Tyumen is incorporatit as Tyumen Urban Okrug. The legislative authority o Tyumen is the Ceety Duma. In addition tae legislative activities, the Ceety Duma appoints the Heid o the Tyumen Ceety Admeenistration, who is the chief executive officer o the ceety. Tyumen haes a humid continental climate (Köppen climate classification Dfb) wi wairm, somewha humid simmers an lang, cauld winters. The wather in toun is vera chyngeable, an the temperatur in toun is ayes heicher than in the surroondin aurie bi a few degrees. The toun aurie attracts mair precipitation an aw. The average temperatur in Januar is −16.7 °C (1.9 °F), wi a record law o −50 °C (−58 °F) (Februar 1951). The average temperatur in Julie is +18.6 °C (65.5 °F), wi a record heich o +38 °C (100 °F). The average annual precipitation is 457 millimeters (18.0 in). The wettest year on record wis 1943, wi 581 millimeters (22.9 in), an the driest wis 1917, wi anerlie 231 millimeters (9.1 in). Tyumen's population grew steadily frae the 16t century throu the 19t century. Housomeivver, when the Trans-Siberie Railwey came throu at the end o the 19t century, the toun's rate o population growthe wis greatly boostit. Tyumen rapidly became the lairgest toun in the region, wi approx. 30,000 indwallers bi the beginnin o the 20t century. Tyumen again experiencit rapid population growthe wi the comin o Warld War II. The evacuation o wirkers frae factories in central Roushie in 1941 mair nor doubled Tyumen's population tae 150,000. In the 1960s, the discovery o the rich ile an gas fields in Wastren Siberie caused the ceety's population, which haed no been forecast tae exceed 250,000 indwallers that decade, tae swell tae amaist hauf a million. Efter the growthe o the 1960s, a period o population stability lastit till 1988, whain economic depression hit the Soviet Union. The ceety's population in 1989 wis 476,869, accordin tae the census o that year. Housomeivver, athin five or sax years Tyumen wis again a major economic centre wi a risin population. 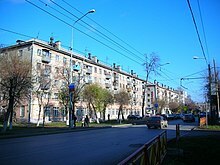 Bi 2002, Tyumen's population haed risen tae 510,719. Further population growthe (mainly due tae migration an the incorporation o surroondin dounsets) meant that bi 2008 regional govrenment statistics put Tyumen's population at 588,600 indwallers. As o 2009, thare are ower ten operational Orthodox temples (baith newly biggit an historical), twa mosques (baith newly biggit), ane synagogue, an ane Roman Catholic kirk in Tyumen. While the state releegion o the Roushie Empire wis Orthodoxy, this releegion historically prevailed in Tyumen. In 1616, Trinity Monastery wis establisht in Tyumen bi Nifont o Kazan. In 1709-1711, this monastery wis rebuilt in stane bi the order o Filofey Leshchinsky, the first Metropolitan o Siberie. In 1761, the Tyumen Releegious Schuil wis establisht. Oweraw, frae 1708 tae 1885, twal stane Orthodox temples o different size, an twa monasteries wur constructit in Tyumen. Durin Soviet times, twa o the temples wur completely destroyed, but the rest remained. As o 2008, maist o thaim are accessible an returned tae operational state. At the stairt o 2009, ane o the destroyed temples is bein restored tae dooble size at a new location, an anither is unner discussion. Some operational temples are unner restoration an aw. Tyumen Releegious Schuil wis reopened in 1997. Despite Orthodoxy predominance, in the past Catholic kirks an temples o Islam an Judaism wur biggit an aw. Housomeivver, anerlie ane Catholic kirk remains preservit. The Tyumen Mosque wis completely destroyed, but the mosque's reconstruction on the same steid caused controversy. The Tyumen synagogue collapsed in 2000, but wis reconstructit on the same steid. At the stairt o the 20t century, thare wis a strang Auld Believers commonty in Tyumen. Aw o the aforementioned releegions operate cultural centres in Tyumen. Thare are several ither releegious bodies wi a few adherents in Tyumen an aw. Tyumen Trinity Monastery wis biggit wi special permission o Peter the Great. At the time, the construction o stane biggins ootside Saunt Petersburg wis prohibitit. Kirk o Savior Uncreatit wis visitit bi Croun prince Alexandr (later Alexander II) durin his Siberie tour. Tyumen is an important service centre for the gas an ile industries in Roushie. Due tae its advantageous location at the crossin o the motor, rail, watter an air wey an its moderate climate, Tyumen wis an ideal base toun for servicin the ile an gas industrie o wastren Siberie. As a result, Tyumen is the day the centre o industrie, science, cultur, eddication an medicine. Mony warld level ile an gas companies sic as Gazprom, LUKoil an Gazpromneft, TNK-BP, Shell (Salym Petroleum Development N.V.) hae thair representative offices in Tyumen. Thare are numerous, factories, ingineerin companies, ile industrie service companies (KCA DEUTAG an Schlumberger), design institutes shipyard an ither ile servicin companies locatit in Tyumen. Tyumen is ane o the Roushie ceeties an touns which hae its awn Technopairk. UTair is based in Tyumen an aw. The ceety haes a quite guid selection o recreational activities o aw kynds for ony ages. Tyumen is a destination for a fair nummer o tourists, in pairticular frae Germany. Thare are three varsities an several tens o colleges in Tyumen. Is is ane o the Medical Centres o the Roushie Federation sae its population can receive maist o heich tech medical services locally athoot need tae go tae Moscow or elsewhaur. Tyumen railwey station wis biggit in 1885. Currently Station Admeenistratively belangs tae the Tyumen Diveesion o Sverdlovskaya Rail Road. Station is locatit in the vera centre o the Tyumen ceety in 15 minutes walk sooth frae the ceety haw. Station services suburban, interceety an internaitional passenger traffeck. At the regional level the station services three directions tae Yekaterinburg, tae Omsk an tae Tobolsk. Railroad tae Yekaterinburg electrifee'd syne 1980. Direct internaitional passenger directions (Trans-Siberie Railwey): Poland, Germany, Cheenae, Mongolie. Addeetional stations athin ceety territory: Tyumen North, Tyumen yard, Voynovka yard. Public transportation in Tyumen is dominatit bi baith municipal bus services an bi numerous private operators (marshrutkas), which accoont for nearly a third o aw transport capacity. The ceety's bus fleet is in process o modrenisation an expansion, wi newly acquired Roushie buses replacin the severely agit Soviet models. Tyumen is a major hub for interceety bus service, centered on the bus-terminal, which wis constructit in 1972, an greatly expandit atween 2006 an 2008. Tyumen is servit bi the internaitional Roschino Airport locatit 13 km wast o the ceety. In addeetion Plekhanovo Airport is in the aurie. The Roschino airport haes permits tae handle wi the follaein teeps o aircraft: Tu-154, Tu-134, An-12, An-24, An-26, Yak-40, Yak-42, IL-18, L-410, B-737, B-767, B-757, IL-86, IL-76, ATR-42, ATR-72, HS-125. The airport haes a permit tae handle aw teeps o helicopters. The airstrip is capable tae handle wi huge aircraft sic as An-22 Antaeus. Tyumen haes vera difficult road scheme. The toun is dividit bi Tura River Tyumneka River an Trans-Siberie Railroad, creatin several isolatit zones. Seiven brigs, ane fuitbrig, five flyovers, an five fuit crossins connect thir zones. In addeetion, the Tyumen Road netwirk wis planned afore the faw o the Soviet Union an in its current state, it is capable tae operate normally anerlie in the scheme which includes public transportation anerlie. Compact plannin o ceety centre prevents expansion o main roads; congestion comin frae the ceety perephery muives slower an slower as it approaches the toun centre. Tae date, the road netwirk is congestit aboot 200% abuin capacity, which leads tae numerous traffeck jams an heich accident rates. Syne 2002, ceety an regional authorities hae unnertaken numerous initiatives tae impruive Tyumen road netwirk; due tae growthe o private automobile awnership, this aw haed anerlie a short term effect. Tae date, a complex transport infrastructur reconstruction project is bein directit bi Regional Admeenistration. The tot lenth o the ceety roads - 925 km (Jan 2009). Historically, Tyumen occupeed a sma aurie on the heich bank o the Tura River aroond the foondation steid o the ceety. The ceety consistit o ane an twa story firthen biggins, surroondit bi a nummer o veelages. Wi time, the territory o the ceety wis developit an extendit bi includin the surroondin veelages. Present-day Tyumen haes a decentralisit feel. When viewed frae abuin, Tyumen appears tae be a collection o law-rise touns wi occasional clusters o taw biggins. Twa auries o the ceety, Yamalskaya Sloboda an Republic Street are notit for thair historic character. Thir auries are dominatit bi auld brick an firthen merchant hooses an biggins, wi the occasional intrusion o mid-century Soviet law-rise biggins. Bukharskaya Sloboda - a Historic residential aurie on the law bank o the Tura river. This aurie is maistly made up o vera auld ane an twa story firthen biggins. The aurie is pairt o the Historical Centre on the ceety an haes a maistly Muslim population. Law bank Dormitories - this cluster o staundart 9 story biggins wis biggit on reclaimit laund east o Bukharskaya Sloboda - Zareka an Vatutina. Ceety Centre - the aurie at east o the Historical toun biggit atween 1948 an 1978 an is maistly 4 an 5 story biggins. Earlier biggins in this aurie hae individual designs, but the later builtins hae a rectangular style. This aurie contains maist o the poleetical an business activities o the toun. New Centre - the modren aurie amaist at the centre o the toun an is biggit ower demolisht firthen hooses an industrial auries. This aurie contains maistly taw biggins an is a mix o the dormitory auries an business centres. Auld Dormitories - this aurie featurs staundart 5 storey blocks o flats constructit in the 1960s an 1970s at the wast an east extremities o the ceety. Housomeivver, the day this aurie is actually in the toun center. While thare are amaist nae variety in the aurie's airchitectur, this aurie haes the maist greenery in the ceety an the best social infrastructur. New dormitories - this aurie featurs clusters o staundart taw biggins constructit efter year 1980 at the sooth an sooth-east edges o Tyumen. This aurie is considered tae be the warst place tae live in the ceety. The aurie is remote, badly planned, an haes vera poor social infrastructure. The best featur o this aurie is a better natural environment when compare tae ceety centre. Tyumen is too diverse tae be characterisit bi ony pairticular airchitectural style, an it generally haes nae oweraw style whasoiver. The toun wis biggit an nan-planned for decades an acause o that its airchitectur is an eclectic mix o biggins o different styles an eras. The phenomenon o Tyumen is accent absence. Durin aw its history Tyumen leid environment wis niver isolatit lang enough tae form ony kynd o accent. As a merchant toun Tyumen permanently kept in contact wi Roushie caipital territories an aye receivit mony fowk frae aw ower the kintra. This fact furthered the preservation o leeterar leid an tae the present day fowk in Tyumen speak Roushie completely the same as the fowk in Saunt Petersburg or in Tver. Vera few slang wirds are in uise an thir are uisually slang wirds in general uise throuoot Siberie. Tyumen haes a range o entertainment possibilities for aw ages. Thare are mony cinemas includin twa wi heich cless stereo seestems, an clubs. Tyumen haes haed its awn Drama an Comedy Theatre syne 1858. Thare is a profeesional Puppet Shaw an the Angazhement Youth Theater. The Tyumen Muisic Hall is ane o the maist common venues for tours o Roushie an Warld cless Muisic Stars. The Tyumen Circus is the maist contemporary in Siberie an ane o the best in the whole o Roushie. Tyumen affers a great variety o cuisine in its numerous restaurants an bars. Thare are some annual events takkin place in the toun sic as the Student Spring Muisic shaw an Day o The Ceety Shaw. Tyumen haes no been the settin for too mony wirks o leeteratur; housomeivver thare wur some poets an writers in the toun history. A writer closely associatit wi the ceety is the childer's writer Vladislav Krapivin. A famous Roushie writer Mikhail M. Prishvin spent his youth in Tyumen as well. Viktor L. Strogalschikov ane o the modren Roushie writers is livin in Tyumen an aw. A modren Roushie producer Konstantin V. Odegov wis born an studiet in Tyumen. 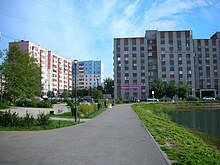 Tyumen wis the location for a few episodes in Roushie films. Thare are numerous museums an airt galleries in Tyumen. The best kent are the Tyumen Museum o Local Lore an the Tyumen Fine Airt Gallery which wur mergit last year bi local govrenment decision. Muisic haes ayes attractit the attention o Tyumen's indwallers. The toun haes its awn philharmonic orchestra an the Tyumen muisic haw haes steady auditory. While performin Roushie tours Muisic Stars will veesit the Tyumen athoot fail. For mony years Tyumen wis the soorce for the Soviet an the Roushie sport reserve. Mony o the maist famous Soviet an Roushie sportsmen stairtit thair career in Tyumen youth sport includin Soviet cycle racin starns Sergey Uslamin, Yury Korotkikh, an Oleg Polovnikov. Thare are some Tyumen Biathlonists in the current Roushie naitional team. The day Tyumen affers a nummer o sport activities for aw ages. Thare are numerous sport an fitness clubs aroond the toun. Tyumen haes a Naitional Level Soccer Team, Hockey team an Futsal team. Thare are three aw saison ice arenas, a soccer field (amateur fields are no coontit), a ski centre, a hippodrome, a shuitin range, several tennis-courts includin in the open an aw saison, three Olympic sized puils. In winter time pairks for the cross kintra skiin are available aroond the toun. Tyumen is a toun o students. The great boost tae Tyumen Eddication development wis gien in the 1964 when the Tyumen Industrial Institute wis foondit tae supply ile industry bi qualified local workforce. Mony academies o the different disciplines wis foondit in Tyumen syne this date, an nou the Higher Eddication is ane o the major economic activities o Tyumen. Thare are ower 10 academies, includin three varsities in the toun an dozens o colleges. In the educational year o 2008-2009 the five lairgest Academies o Tyumen thegither haed ower 110,000 students. Thare are ower ane hunder seicontar schuils in Tyumen. Thare are aboot fifty public libraries in Tyumen. In addetion thare are several corporate libraries integratit intae public libraries beuk exchynge seestem. The Tyumen special is the Tyumen Regional Scientific Library efter D.I. Mendeleev which haes aboot 2 670,000 unic units o issue in its stock . ↑ 2.0 2.1 2.2 "Charter of Tyumen (city proper) January 1, 2010. The Tyumen City Administration". Retrieved 2010-05-11. ↑ 3.0 3.1 "Head of Tyumen (city proper)January 1, 2010. The Tyumen City Administration". Retrieved 2010-05-11. ↑ 4.0 4.1 4.2 "Geography of Tyumen (city proper), January 1, 2010. The City Government of Tyumen". Retrieved 2010-05-11. ↑ "Tyumen postal codes (Russian Post) January 1, 2010. The official site of the Tyumen Post Office". Retrieved 2010-05-11. ↑ "Population of Tyumen (city proper)1 Janyary 2010. The City Government of Tyumen". Retrieved 2010-05-11. ↑ "Тюмени паводок не страшен (Flooding is no threat to Tyumen)". ↑ "Уровень воды в р. Тура не превышает паводкового значения (Тюмень) (Water level in the Tura River does not exceed the [normal] spring-flood mark)". ... максимальный уровень паводковых вод в Тюмени составил 9,15 м в 1979 г., а в 2007 г. он составлял 7,76 м.
Тюменская областная Дума. Закон №53 от 4 ноября 1996 г. «Об административно-территориальном устройстве Тюменской области», в ред. Закона №2 от 28 февраля 2013 г. «О внесении изменений в статьи 13 и 14 Закона Тюменской области "Об административно-территориальном устройстве Тюменской области"». Вступил в силу с момента официального опубликования. Опубликован: "Тюменские известия", №220, 12 ноября 1996 г. (Tyumen Oblast Duma. Law #53 of November 4, 1996 On the Administrative-Territorial Structure of Tyumen Oblast, as amended by the Law #2 of February 28, 2013 On Amending Articles 13 and 14 of the Law of Tyumen Oblast "On the Administrative-Territorial Structure of Tyumen Oblast". Effective as of the moment of official publication.). Тюменская областная Дума. Закон №263 от 5 ноября 2004 г. «Об установлении границ муниципальных образований Тюменской области и наделении их статусом муниципального района, городского округа и сельского поселения», в ред. Закона №100 от 4 декабря 2012 г. «О внесении изменений в Закон Тюменской области "Об установлении границ муниципальных образований Тюменской области и наделении их статусом муниципального района, городского округа и сельского поселения"». Вступил в силу 1 января 2005 г. Опубликован: "Тюменская область сегодня", №213 (без приложений), 12 ноября 2004 г. (Tyumen Oblast Duma. Law #263 of November 5, 2004 On Establishing the Borders of the Municipal Formations of Tyumen Oblast and on Granting Them the Status of a Municipal District, Urban Okrug, and Rural Settlement, as amended by the Law #100 of December 4, 2012 On Amending the Law of Tyumen Oblast "On Establishing the Borders of the Municipal Formations of Tyumen Oblast and on Granting Them the Status of a Municipal District, Urban Okrug, and Rural Settlement". Effective as of January 1, 2005.). This page wis last eeditit on 13 August 2018, at 17:15.